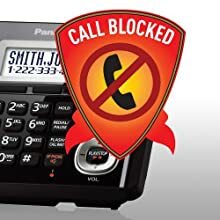 With dedicated Call Block buttons on both base unit and handset, it's easier than ever to block telemarketers, robocallers and others — even while the phone is ringing or while talking. 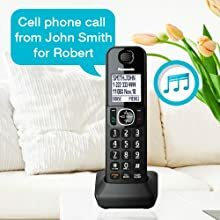 A simple push of a button instantly registers the unwanted number into the phone's 250-number call block database, and you can manually register any number, any time you want. 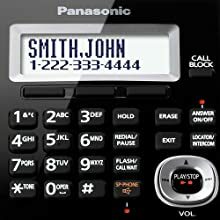 When a call comes in the handset will announce the name of the caller. 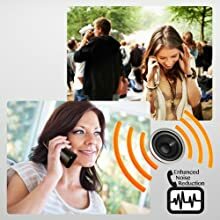 Whether someone's calling from a busy city street or inside from a raucous room, Noise Reduction automatically suppresses background interference while also enhancing voice tones for clearer, more comfortable conversation. 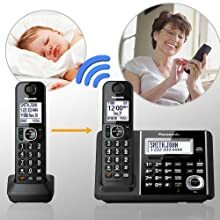 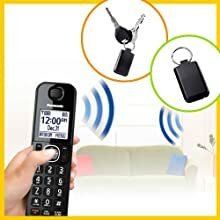 With a small, optional detector device* on your household or car keychain, this Key Detector-ready phone system lets you quickly locate misplaced keys when you need them with a button on the cordless handsets.